He is perhaps best known for having coined the term "dinosaur" (or actually "dinosauria") in 1842 - it means "terrible reptile". Owen created, in conjunction with Benjamin Waterhouse Hawkins, the first full-size dinosaur reconstructions. These were originally produced for the Great Exhibition of 1851 and displayed in Crystal Palace, London, with a total of 33 models eventually produced. Perhaps the most famous story about these models, is that Owen hosted a dinner for 21 prominent men of science inside the model of Iguanodon New Year's Eve, 1853. The surviving models are today located in Dinosaur Court in the Crystal Palace area of South London. Owen was perhaps the person most directly responsible for the foundation of the British Museum (Natural History) in South Kensington, London, England, which is today of course known as the "Natural History Museum". Owen was born on July 20th n 1804, in Lancaster, England. He was educated in Lancaster Royal Grammar School, the University of Edinburgh, and in St Bartholomew's Hospital London. Although Owen considered a career as a surgeon, he was in fact more interest in anatomical research. He eventually accepted a position as assistant to the conservator of the museum of the Royal College of Surgeons, and abandoned medical practice. In 1836, Owen was appointed as a Hunterian professor of the Royal College of Surgeons, in 1849, he became the conservator of the museum of the Royal College of Surgeons, and then in 1856, he became superintendent of the natural history department of the British Museum. 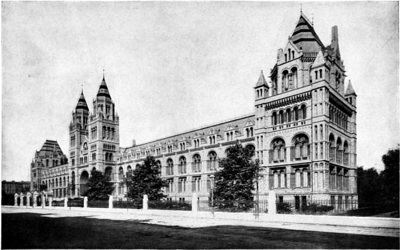 His work with the British Museum including creating a new Natural History building in South Kensington (today the Natural History Museum), and in 1884 he was knighted. Owen retired, and died in 1892 in Sheen Lodge, Richmond Park, South London. 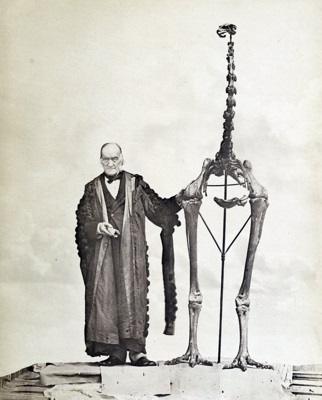 During his career, Owen wrote numerous scientific papers, including anatomic descriptions of many animals, including both vertebrates and invertebrates, and both extant and extinct (fossil) animals. He was even granted right of first refusal of any animal carcasses from London Zoo, and, as result, according to legend, his wife once returned home to find a dead rhinoceros in the hallway of their house. Although Owen recognized many similarities between different animals, Owen took them as evidence of "archetypes" in god's mind, rather than as evidence of common descent. After Charles Darwin published "On the Origin of Species by Natural Selection", in 1859, Owen, in his position with the British Museum, received many letters (pro-, anti- and inquiries) concerning the book, and initially avoiding expressing a view, but rather argued in favor of a new Natural History Museum. However, in 1860, an anonymously bylined review of "On the Origin of Species by Natural Selection" written by Richard Owen, appeared in the Edinburgh Review, and Owen gradually became engaged in a fierce and bitter dispute with Darwin's followers, especially T. H. Huxley. Nevertheless, a fossil of one of the transitional animals (Archaeopteryx) predicted by Charles Darwin was bought by Owen for the British Museum in 1863 (although Owen described it as simply a bird, rather than a proto-bird or transitional form). Aside from the controversies over evolution and Natural Selection, Owen was also involved in a number of other controversies and disputes during his career. 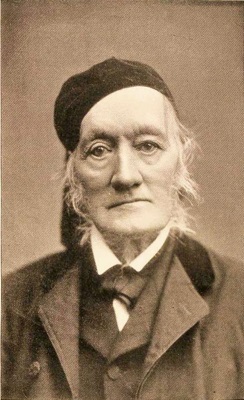 Although he began on friendly terms with Owen, Darwin himself wrote "I used to be ashamed of hating him so much, but now I will carefully cherish my hatred and contempt to the last days of my life".